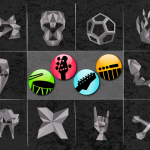 With “vinyl beat foundation,” apps4use has released the third interactive track for its Android music game GrooveGrid. The other tracks available so far – “ignition!” and “groove digga mc” – enable players to create their own rock or hip-hop tunes. Thanks to the new “vinyl beat foundation” track, players can become their own DJs and mix timelessly groovy house and dance beats. The track – which both looks and sounds good – unites elements of early eurodance with warm, analog synthesizer sounds and sophisticated house rhythms. As with its previous tracks, apps4use paid utmost attention to the production of the sound loops. All the sounds were cut on real synthesizers and drum machines, and recorded in studio quality. “vinyl beat foundation” is available immediately for download from the Google Play store. If you already have the current version of GrooveGrid installed, you can install the new track straight from the app. Check out YouTube to watch a video showing “vinyl beat foundation” in action. GrooveGrid is an interactive music game for Android smartphones and tablets. With GrooveGrid, it’s incredibly easy to make music by moving tiles across a virtual board. The tiles represent the individual musical instruments. You hear a different part of the interactive track depending on the field where an instrument is located. For more information about “vinyl beat foundation” and GrooveGrid, go to http://groovegrid.com. In the Google Play store, you can find the track at https://play.google.com/store/apps/details?id=com.apps4use.groovegrid.loopset.vinylbeatfoundation. GrooveGrid can be installed free-of-charge at http://play.google.com/store/apps/details?id=com.apps4use.groovegrid. You can also find us on Twitter, Facebook, and Google+. Crie canções exclusivas e divirta-se misturando os sons neste aplicativo. Brazilian Tech site Baixaki just reviewed GrooveGrid. Android Police took look at the new apps from the last 3 weeks and elected GrooveGrid to be amoung the best 53. AndroidPIT, Germany’s leading Android site, just published a review of our interactive music game GrooveGrid. Update January 15: AndroidPIT just published an English translation of review on their international site. Update January 17: AndroidPIT published a Portuguese translation of the GrooveGrid review to their Brazilian site. Update January 18: Russian translation published. Update January 19: French translation published. Update January 25: Italian translation published. With the new app from the German startup apps4use, it’s dead easy to create groovy music while listening to it at the same time. All you do is slide the tiles that represent the individual instruments into the various zones. On each zone, you can hear a different part of the interactive track. While the guitar plays a hard, staccato-like riff when it’s on the zone with the flame symbol, a melodious solo begins as soon as you slide it over to the panther zone. If you move it back to the central area, it falls silent again. Once you add the drums, bass, and synthesizer to the guitar, you soon feel like a rock star impressing the audience with your amazing talent. On smartphones there are 10 different zones. On tablets there are 12. The ways of combining the individual components are therefore almost endless. The tracks are composed in such a way that random combinations sound good and right. No previous knowledge of music is required. You don’t have to add or remove the instruments in time to the music, because the app corrects small timing errors automatically. A slide control allows you to adjust the volume of the individual instruments or of the app as a whole. A short video on YouTube shows you how the app works. In terms of the tracks themselves, the focus is on high sound quality. Most of them were recorded in a studio specifically for apps4use. The sounds are designed in such a way that they sound good on both small speakers – like those integrated into the devices – and big hi-fi speakers. Because of the sounds’ high quality, the app is relatively large – 6 MB – which is why it is usually installed on the device’s SD memory card as standard. The full-fledged interactive track ignition! is already included in the free app. More tracks from different genres are currently being developed and can be purchased separately. There are plans to work with a variety of musicians in the future. What’s more, upcoming versions are slated to have a recording function that will enable you to record and listen to your own compositions, and then share them with others. The app supports smartphones and tablets with a processor speed of at least 1 GHz and Android 2.2 or higher. Because the idea is that the tiles are moved around simultaneously, the device should be multitouch-enabled. GrooveGrid was created in a joint venture between apps4use and the composer and sound engineer Jan Hofmann from Stuttgart, Germany. apps4use has dedicated itself to developing user-friendly apps for Android. Because Android does not inherently support this particular type of app, a great deal of programming work was required before the app could see the light of day. Performance-critical parts were implemented natively in C++. When designing the user interface, the team concentrated on not distracting users from making music. They ensured that the flow remains constant, for example, by not interrupting it with changes of context. The concept is especially suited to Android devices with their very high latency in audio playback, because interaction doesn’t have to be 100% in time. After a beta test phase lasting several weeks, where GrooveGrid was rapturously received, this music app for the Android platform – which is easy-to-use and has excellent sound quality to boot – has now hit the market. Users have a band at their fingertips that enables them to make music on a mobile device and then enjoy it themselves through headphones, the integrated loudspeakers, or even present it to others on a central sound system. So far, the app is unique on the Android market. Check out the app’s web site at: http://groovegrid.com. In the Google Play store, the app is available here: http://play.google.com/store/apps/details?id=com.apps4use.groovegrid. We just published a video showing groove digga mc in action. The GrooveGride beta has been closed. Thanks to all the testers who registered and provided valuable feedback. We are looking for beta testers! In order to participate go to our here. We published a video showing GrooveGrid‘s built-in track named ignition! After almost one and a half year of development, apps4use is proud to announce, that our new and exciting product GrooveGrid is entering it’s last stage of beta-testing.